If you’re looking to come to Byron Bay to experience its famous laid-back attitude and excellent yoga offerings, then be sure to book your next holiday here for the upcoming Byron Spirit Festival, 20-22 April. This three-day Byron Bay festival features tons of workshops on yoga, dance, music, healing and much more. Much of the Spirit Festival will be held in Cavanbah Centre in Byron Bay, located on Ewingsdale Road, approximately 3km from the Byron Bay city centre. Additional workshops and the evening concerts will be held at Elements of Byron, situated at the end of Bayshore Drive. For those who just want a short deep dive, you can attend the post-conference Breathfest workshop on Tuesday, April 23. You can attend for $108. Tickets for the Byron Spirit Festival include several options from full day and evening and entire weekend, to just one evening and kid prices. Check out all your options to figure out what works for you, your schedule and budget. A full weekend now costs $270 per person, whereas individual day and evening tickets cost between $90 (Friday) and $130 (Saturday and Sunday) per person or for just evenings you can come for $35 per person. The three-day event lineup runs the gamut with yoga sessions, meditation, dance workshops, music and all kinds of other interesting sessions. The following are just a few of the highlights that this Byron Bay festival offers for visitors. Friday yoga sessions: Four yoga sessions are offered this afternoon to get the festival started, including Serotonin Shot, which is “an opening in a physical and energetic level to more possibilities and a release of old stagnant patterns.” Class includes individual movement practices, partner flows and a simple therapeutic sequence. Nature Mandala Ritual for Intention Setting: This healing circle will help participants set intentions and let go of old baggage. The session includes meditation, guided journaling and reflection, Sanskrit chanting and the creation of the mandala. The Art of Meditation and Mindfulness: Gary Gorrow presents a workshop that will attendees to learn practical techniques that they can utilise in everyday life to enhance awareness and moment to moment experience. Sacred Salty Rain Dance with Tommy Franklin: Open to all ages, Tommy says anyone can dance, even people in wheelchairs. So don’t make excuses and enjoy learning foundational movements to have fun on any dance floor and how dancing does wonders for our physical, mental and emotional wellbeing. Saturday Night Concert: This evening begins with Amaru Pumac Kuntur, Peruvian musicians, followed by a presentation by Edo Kahn, founder and CEO of A Sound Life, Australia’s first charity to transform the lives of people in need through free music, yoga and meditation programs. The night will end with musical group Tijuana Cartel, Australia’s premier ‘east meets west’ electronic beat makers. Sunday yoga sessions: At the festival, there will be 15 sessions of yoga available throughout the day, ranging from kids’ yoga and family yoga, to Flying Dragon Sleeping Swan and beach yoga. So no need to worry, there’s something for every yoga lover or even beginning yoga fan. 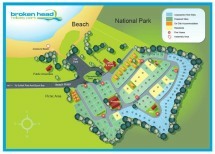 Skip the crowds in Byron proper during the Spirit Festival, and instead stay at Broken Head Holiday Park. Our tranquil setting and affordable accommodation makes a perfect spot to rest your head after your sessions at the Byron Spirit Festival. So book now and start looking forward to your Spirit Festival weekend in Byron Bay!